As dangerous as she is distinctive, the captain of the Danse Macabre revels in the equalising power of death, and celebrates it with their ship. Contents: A sloop-style sailing ship. 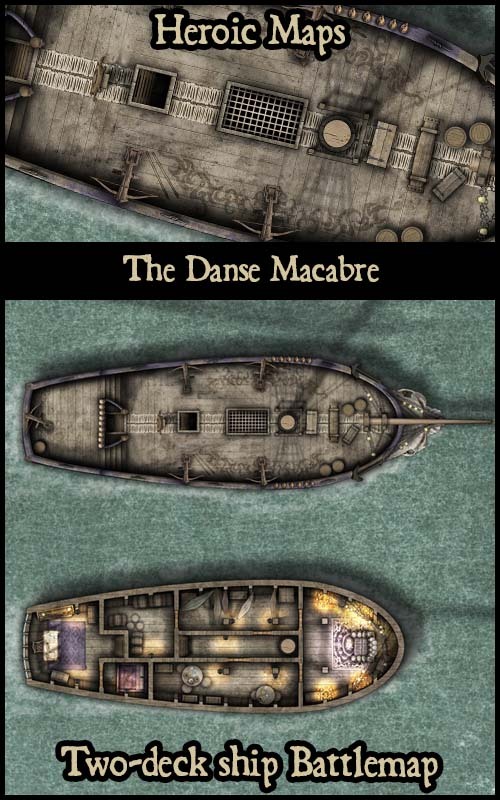 The top deck features a wheel, hatches, five ballistae, a windlass and other nautical details, with grisly skull ornamentation. The lower deck includes the captain's quarters, stores, crew areas and hammocks and a sinister throne for the captain. 300dpi A4 pdf, with gridded map spread across multiple pages for easy printing.
. Je vais certainement acheter la prochaine fois que j'ai des fonds de jeu " sinon super le navire pour du med fan pirate, dans mon cas du naheulbeuk et ou du D&D 3.5. I will definitely be buying this next time I have gaming funds. Thank you Joe & Sarah! I hope this is only the first of several to come please. Some small trebuchets would be nice too please. Maybe even a larger ship with a (gun)/weapons deck of ballista as well, yes? Human like this one, but more naval, less piratical; a sleeker Elven vessel, a more crude, but still functional vessel for orcs, a Dwarven metal and steam-driven ironclad which could have cannon; etc. The only reference I can think of is from back in the '90s done by the "evil empire" Games Workshop - the game Man O' War. A variety of vessels like those, but of course, not those so as to avoid GW's rabid legal team. Anyway - a ballista-armed vessel - hip,...See more Hip, HIP Huzzah!! Thanks again Joe & Sarah!